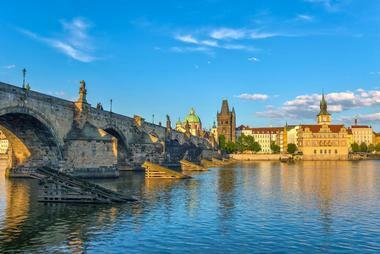 Prague is a great tourist destination and many visitors enjoy seeing this historic city. Summer is the peak season: the weather is warm, but hotels raise their room rates, and, with many schools taking breaks, there are crowds and lines. Prague is known for its cold snowy winters. If you don’t mind this, you’ll be able to score great hotel room rates. Spring between April and June is a good time to visit Prague - the weather is a little chilly but pleasant, there are no crowds, and room rates are reasonable. 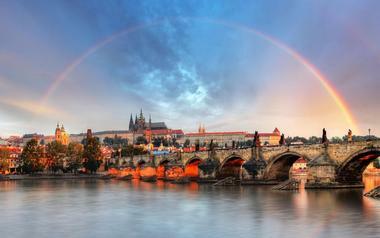 Fall, between September and October, is considered by many the best time to visit Prague, Czech Republic. Like spring, the weather is pleasant, the crowds have disappeared, and room rates are lower. In January, Prague receives the coldest weather in the whole year with the low temperature averages measuring in at a chilling 25°F (-4°C). High temperatures are also very chilly at 36°F (2°C). The precipitation average is the lowest out of the entire year at 20mm. February receives slightly warmer temperatures. In spite of this, the average high temperature and average low temperatures remain very cold at 39°F (4°C) and 27°F (-3°C) respectively. Prague Weather in March: The weather gets warmer in March with the average high temperature rising to 46°F (8°C). Low temperature averages also increase a handful to 32°F (0°C). April sees high temperatures increase over 10 degrees to 57°F (14°C). The low temperature measures in at 39°F (4°C). The precipitation average is about 33mm. In May, days are enjoyably sunny with a daily average of 9 hours of sunshine. The high temperature average and low temperature average range between 64°F (18°C) and 46°F (8°C). June experiences an increase in temperature averages with the high temperature measuring in at 70°F (21°C). The low temperature is 52°F (11°C). Prague Weather in July: The hottest month of the year in Prague is July with the average high temperature peaking at 73°F (23°C). This coincides with the highest daily sunlight average of the month – 11 hours per day. July also receives the highest precipitation rate of the year with about 69mm of rain. Low temperatures climb to 55°F (13°C). In August, the average high temperature remains the same. On the other hand, the low temperature average decreases by a single degree to 54°F (12°C) making this month the second warmest of the year. September receives much cooler weather with the average high temperature decreasing quickly to 66°F (19°C). The average low temperature also sees a significant decrease to 48°F (9°C). In October, Prague has relatively dryer weather with the precipitation rate barely reaching 24mm. High temperatures decrease quickly again for this month at 55°F (13°C). Low temperatures also see a drop to 41°F (5°C). Prague Weather in November: Things start to get chilly in November as the average high and average low temperatures sink further to 43°F (6°C) and 34°F (1°C) respectively. December sees very little daylight with each day averaging about 3 hours of sunlight. This coincides with the bone chilling high temperatures of 36°F (2°C) and much colder low temperatures of 28°F (-2°C). The best time to visit Prague by far is in the spring months of March through May and the early autumn month of September. The climate is the best during this time along with a low influx of tourists. For a festive vacation, visiting during December is ideal as there is a fair amount of snow at a decent and mild temperature. To enjoy lower and more affordable room rates, the best times to visit are March, April and September. Many visitors arrive by airplane. The Vaclav Havel Airport Prague is the city’s airport and the gateway to the Czech Republic. Located about 12 miles northwest of the city center, the airport has two terminals: terminal 1 is for international flights outside of the European Union while terminal 2 handles flights from within the European Union. Prague can easily be reached by train because of Europe’s great train system. Trains arrive from cities like Vienna and Budapest into one of two train stations: the Hlavni Nadrazi Station and the Nadrazi Holesovice Station. Buses arrive at the Central Bus Station-Florenc from cities all over Europe. If you are arriving by car, there are many highways that lead to Prague. The Vaclav Havel Airport Prague offers several ways to get into the city center. The least expensive way to get into the city is by public bus: these include city bus 119, city bus 100, and a special Airport Express (AE) bus that runs to Prague’s main train station. CEDAZ is a company that runs a shared-ride minibus from the airport into the center of the city. Taxis are also available at the airport: trips into the city take about 25 minutes except during rush hour when it can take an hour. AAA Radiotaxi is a reliable taxi company. There are also car rental agencies at the airport. Prague has an excellent public transportation system that is made up of a subway, trams, and buses. The Metro has three underground metro lines that take passengers around the city. You can buy single tickets as well as one, three, or five day unlimited ride passes. These passes not only save you money but also save you the bother of trying to figure out the very complicated single ticket system. There are 24 tram lines that go to most parts of the city. Tram 22 and 23 are known as the “tourist trams” because they pass most of the city’s popular attractions. Buses mostly run around the outskirts of the city, so visitors don’t often use the buses. 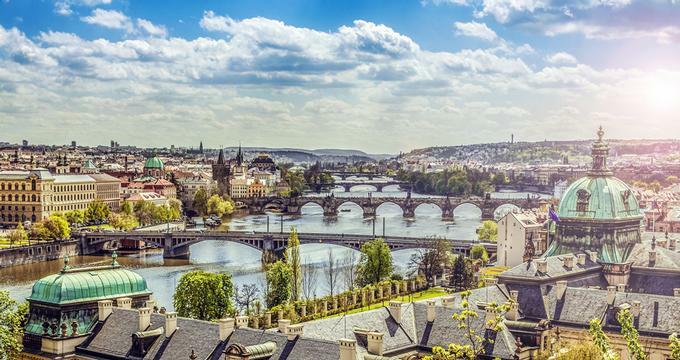 Prague has a great public transportation system, but since many of the most popular attractions are close to each other, you can walk around the city. The many historic neighborhoods are compact and if you get tired of walking, hop on the public transportation system, or sit down and enjoy some coffee. Taxis should only be used as a last resort: there are no fare regulations and drivers are known to cheat passengers. It’s better to call for a taxi rather than find one on the street. Driving a car in Prague is problematic because it is frustrating and parking is expensive. Because of the cobblestone streets, rent a mountain bike if you want to explore Prague by bike. 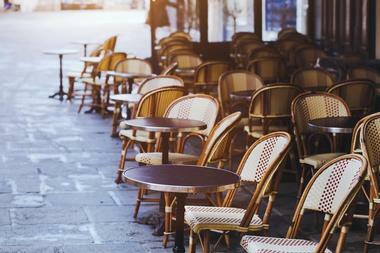 Prague has a variety of restaurants: visitors are sure to find some good food in this city. There are fine dining restaurants like the Michelin starred Allegro in the Four Seasons Hotel. If you are interested in authentic Czech food, avoid the restaurants in the tourist areas around the Old Town Square and on Karlova Street: these serve drab imitations at high prices. It’s better to explore an area outside of the city center and try a Czech restaurant there. 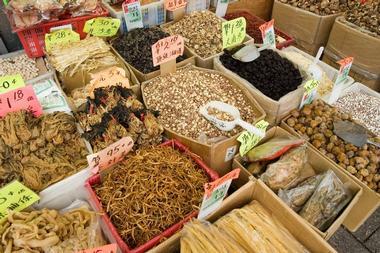 In addition to Czech restaurants there are many restaurants that serve ethnic cuisine such as Chinese, French, Indian, Italian, Japanese, and more. 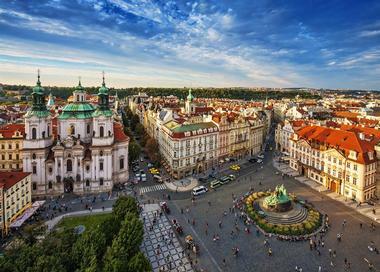 With more and more tourists coming to visit Prague, the shopping scene has blossomed with trendy and expensive boutiques, specialty shops, and shopping malls. 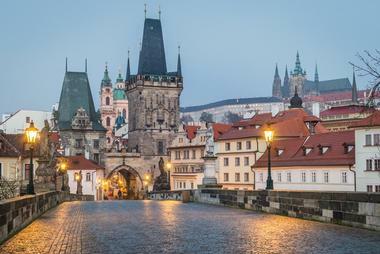 Prague is now a city with many luxury designer stores and it rivals other European cities. You might be able to find some deals, especially during sales, because labor and rents are cheaper in Prague than in some other European cities. If you are interested in buying a piece of Czech handiwork, this is the place: here you’ll find some of the finest crystal and glass in the world. Other things of interest are antiques, art, and books. Prague is divided into neighborhoods, and some of these will be of more interest to visitors than some of the other neighborhoods. 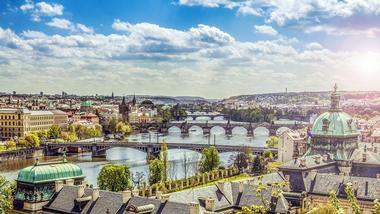 Hradcany is the castle area that is located on the left bank of the city’s River Vltava. This is the highest point in the city and the Prague Castle is located here: it is probably the most famous landmark in Prague and one of the largest medieval castles in Europe. The 14th century St. Vitus Cathedral lies within the castle. 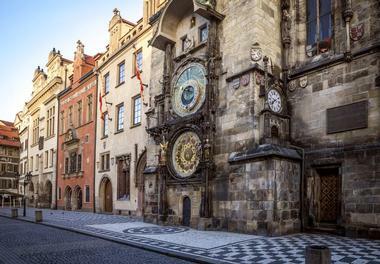 Old Town contains some of Prague’s most historic landmarks like Old Town Square, the Astronomical Clock, and Charles Bridge. Jewish Town is next to Old Town and contains historic synagogues. 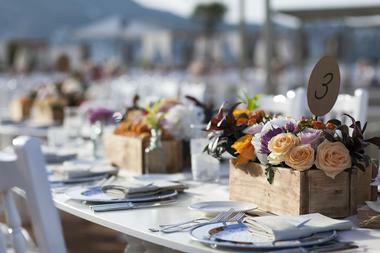 Prague is a beautiful and romantic city with many choices for wedding venues. Some of the hotel wedding venues include the Four Seasons Hotel Prague, the Mandarin Oriental Prague, Mamaison Suite Hotel Pachtuv Palace, the Augustine Prague, the Boscolo Prague Hotel, and more. Chateaux and palaces are very popular choices for weddings and there are many from which to choose such as the Chateau St. Havel, the Lobkowicz Palace in the Prague Castle complex, Martinic Palace, Palffy Palace, the Municipal House which is an Art Nouveau palace, and more. Other interesting wedding venues include the Old Town Hall and churches like the Basilica of Sts. Peter and Paul and the Church of St. Giles. Prague is known for having high hotel room prices like Paris. At one time there were not enough hotel rooms in Prague; after a building boom there are now too many rooms. This is good news for visitors because hotel room rates have come down a bit. Many visitors want to stay in the most popular tourist areas with views of the castle or the river. Luxury hotel properties include the Aria Hotel Prague, the Augustine Hotel, the Ventana Hotel Prague, the Four Seasons Prague, and more. The suburb of Vinohrady is an alternative for accommodations. It is located in a quiet residential area just a tram ride away from the city center.